The ‘Lincoln’ and ‘Munich’ writer is adapting the title as a feature film. Brad Pitts Plan B and Cross Creek Pictures are teaming up to produce an adaptation of He Wanted the Moon, a memoir by Mimi Baird and Eve Claxton. Tony Award- and Pulitzer Prize-winning writer Tony Kushner, whose credits include the Steven Spielberg movies Lincoln and Munich, has been hired to adapt the book  whose complete title is He Wanted the Moon: The Madness and Medical Genius of Dr. Perry Baird and His Daughters Quest to Know Him  into a feature film. Cross Creek’s Tyler Thompson and Brian Oliver are producing with Plan B.
Mimi Baird is the daughter of Perry Baird, a doctor who was ravaged by mental depression and suffered through treatments in the 1930s and 1940s, a less-enlightened time for mental treatment where cures ran the gamut from being straightjacketed to being lobotomized. Mimi Baird discovered a manuscript her father had written while committed (it detailed his escape attempts, his divorce and his fall from grace in the medical community) and then began piecing together the heartbreaking circumstances that occurred decades earlier when father left her at the age of six and the rest of the family refused to talk about him. 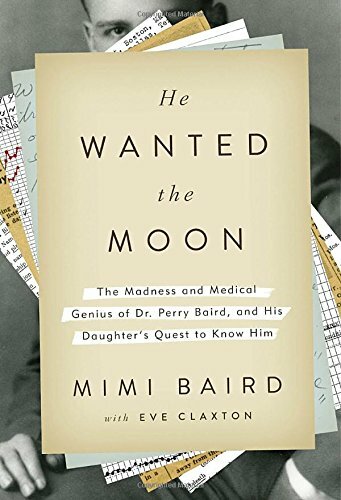 In the book, Baird recounts how she sought to get her father the overdue credit he deserved from the scientific community while also trying to give voice to those suffering from mental illness.